Having a roof installed is something most people deal with once or twice in a lifetime. Most homeowners have very little to no knowledge of Roofing and the materials that are used. 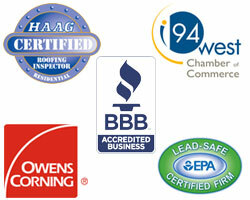 So it is a good idea to do some research or just make one call to Johnson Exteriors to handle your roofing needs. As a homeowner, it is never a good sign when you see water stains on a ceiling or running down your wall. This is usually a good sign that your roof needs to be repaired or replaced due to some recent weather related event. Nobody likes to think of the hidden damage this might have caused to your home. If it has started leaking through the ceiling that means that the plywood might have been damaged as well as your sheet rock and insulation. Our trained staff can handle any Roof Leak Repair. If you have these kind of issues this is generally a sign that you may have some kind of wind damage to your roof or shingles. This happens when high winds or straight line winds blow over your roof and take unsealed shingles and either bend them straight back or blow them off of your roof, therefore exposing the underlayment and decking underneath the shingles. Depending on the severity of your situation this can either be a simple Roof Leak Repair or a phone call to your insurance carrier to file for a homeowners insurance claim. If your home has damage from some kind of storm, the best thing to do is contact Johnson Exteriors. We are a Licensed General Contractor that specializes in helping homeowners like you deal with Storm Damage Repair. Our specialties are Hail and Wind Damage that occur during severe thunderstorms. We will walk with you through the whole process from beginning to end. We have great relationships with ALL the insurance carriers. It is very unfortunate when this happens but we are here to make the process as easy and painless as possible for you. Some of the things you may notice around your house that you have hail damage could be that all of a sudden the paint on your wood siding got chipped off in numerous places on a couple of sides of your house depending on the direction of the storm. Or maybe your metal siding now has dents in it when you look at it with the right sunlight and at the right angle. If you look at it in the wrong sunlight you will have a tough time seeing the damage. Or possibly you may notice that your vinyl siding now has a bunch of cracks or holes in it which are all very possible with hailstorms. Again, it is very important what direction the storm came from and if there was any swirling or twisting winds? Because if this was the case more often than not homeowners will have damage to Two or Three sides of their home instead of just One or maybe Two sides. If you have any of the above the odds are very good that you also have a Hail Damage Roof. If you think your home might have suffered through a recent hailstorm you should contact us. We give free property inspections to all homeowners who think they might have hail damage to your home. We will thoroughly inspect your roof and walk around your home to look for any signs of damage that may have been created from the hail. All this is great information for you to be aware of during summer storm season or during the winter with some of the storms we get during the winter months. We here at Johnson Exteriors will be happy to Help you in any way possible. Contact us today and join the thousands of satisfied customers that did.